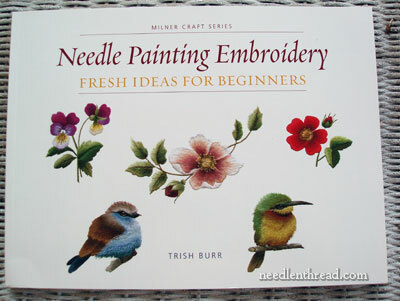 Needle Painting Embroidery: Fresh Ideas for Beginners by Trish Burr is hot off the press – and I think it’s definitely a “must have” for any embroidery library. If you’re keen to learn needle painting (a.k.a. 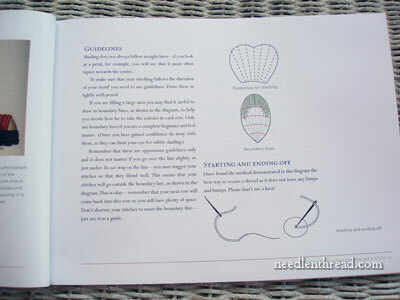 long & short stitch embroidery, silk shading, thread painting), then Trish Burr is one of the best needle artists to learn it from, and this book is going to be one of your favorite resources for both instructions and projects. Needle painting embroidery involves realistically shaded designs, with subjects such as flora & fauna, animals, and people. In her new book, Trish addresses the basics and beyond in needle painting, and takes the embroiderer from simple projects to more complex subjects with step-by-step instructions. The book is very simple in layout and approach, making it accessible to every level of stitcher. 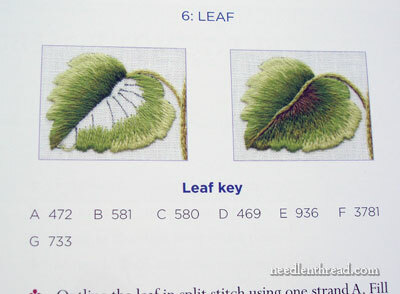 If you’re a beginner and you want to learn to shade a leaf, or if you are an experienced embroiderer who wants to try your hand at stitching a realistic bird, this book will get you there. 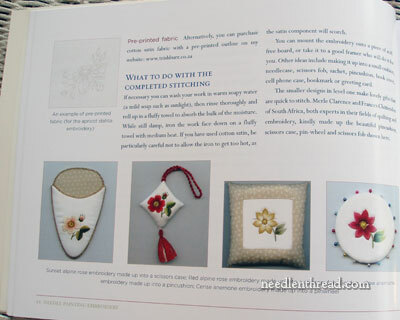 As most embroidery books do, this one begins with a discussion of materials to use and how to set up your project for stitching. Again, the approach is simple and straight forward. There are no hard-to-obtain materials or tools discussed, no difficult set-ups and preparation: everything that you need to work this type of embroidery is easily accessible, and the preparation work is fairly minimal. Following the question of materials and preparation, there is a short section on finishing your embroidered items (beyond framing). 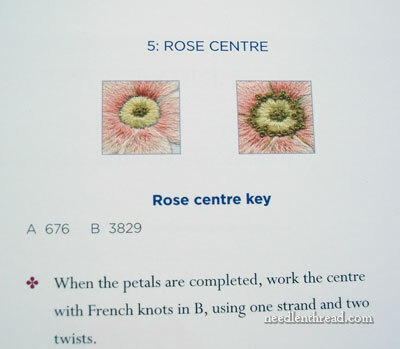 The instructional part of the book begins with an introduction to long and short stitch shading, in which Trish shows the reader the basic concepts of achieving realistic shading with long and short stitch. This is followed by a section of practice motifs. 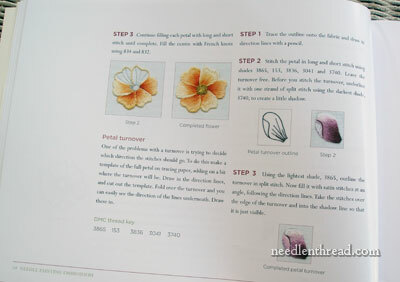 Here, the reader is taken through common shapes and elements used in needle painting, one at a time, step-by-step, in order to become comfortable with the whole process of shaded stitchery. Some of the elements within this section of practice motifs could stand on their own as pretty little projects. Numerous elements are covered in the practice section: the leaf, the petal, the turn-over on the petal, the curved shape, the berry, the fluffy feathers on a bird, the bird’s eye. 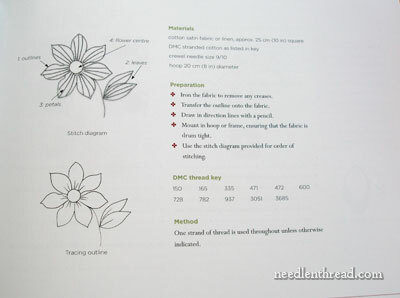 Each part of this section serves as an individual lesson, bringing the stitcher ever closer to excellence in needle painting. 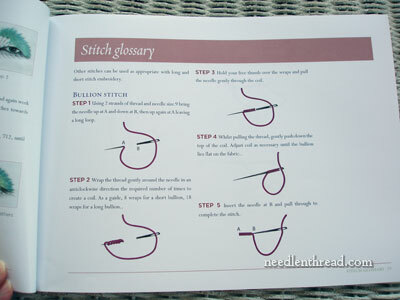 Next up is a stitch dictionary that addresses all the stitches that may commonly be found in needle painting, other than long and short stitch. The projects in the book are divided by degree of difficulty. Level One projects are for beginners…. Level Two projects take the stitcher beyond beginner level…. …. 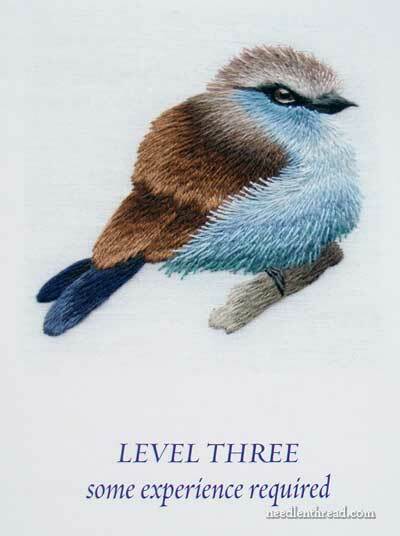 and Level Three projects (this is where you find those adorable birds!) are for those who have had a bit of experience in needle painting. There are a number of projects in each category: 6 in level one, 5 in level two, and 4 in level three. The projects all unfold in the same sequence. First, we get the overall necessary information: materials & preparation, thread list, and a diagram for tracing and one for stitch direction. This is followed by the method of working the project. Trish takes the reader through each project in the order of working, with photos to assist along the way. There are little notes in the side margins, that point out little tricks to getting that perfect shaded look. Each smaller element in each project has its own little section, with photos, a thread key, and stitching instructions. The photos of the smaller elements within the project give a partially completed view of the element, and a completed view – up close, so that you can see what your stitch placement and direction should look like. Every project in the book is mapped out this way, making it so easy for the stitcher to follow through each project successfully. The book ends with the Level Three projects……. 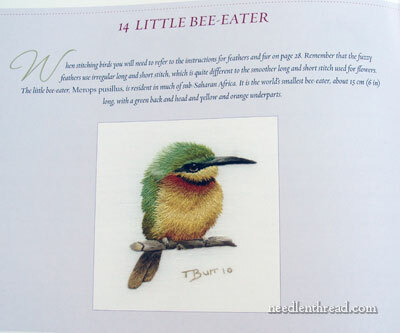 included in which is the Little Bee-Eater. 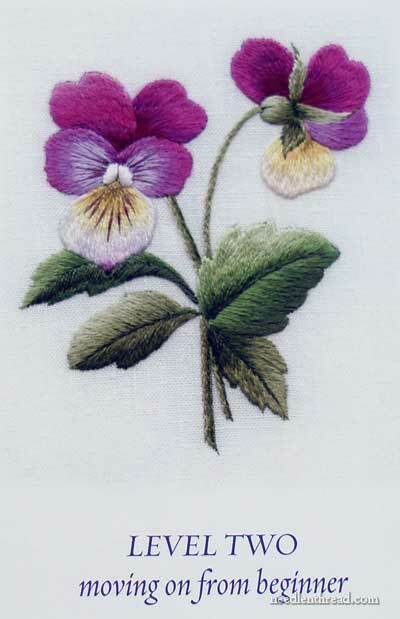 What do I especially like about Needle Painting Embroidery: Fresh Ideas for Beginners? I like its clarity and simplicity of approach. There’s not a lot of complicated information in here. You won’t find complicated and hard-to-acquire materials (all the projects are listed with DMC thread numbers). The book has a very open layout, and is easy to read and easy to follow. Each project is presented clearly and simply. Yep, if you’re looking to venture into needle painting, or have already ventured and want to explore further, this is a book you want on your shelf! It’s what I expected it would be – another of Trish’s excellent instructional books! In the US, Needle Painting Embroidery is available here, through Amazon. 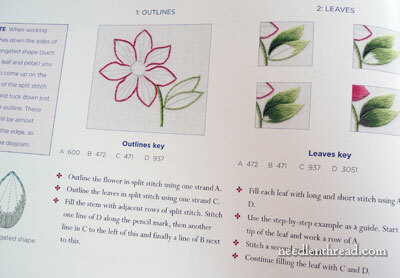 For stitchers outside the US, you can find Needle Painting Embroidery: Fresh Ideas for Beginners available through the Book Depository (with free world-wide shipping). 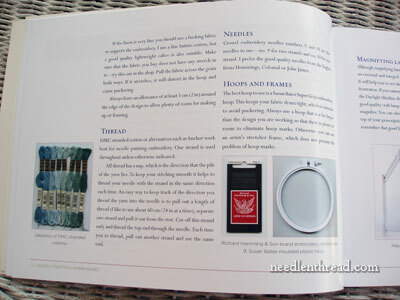 Thanks for the book review I will definitely be buying the book as I love needle painting embroidery its so beautiful. It’s a great idea that you can order the design pre-transferred, although I prefer to learn how to transfer patterns. However for beginners like me it would save time & worry to have some patterns pre-transferred so that all you have to concentrate is the stitching. G’day Mary, Many thanks. Have been trying to xray vision pictures of the cover of this book for a few weeks. Have had it, and the 20th Century Embr Tech book, waiting in my amazon cart for awhile, so now will order with confidence. If hubby says “What the…” I’ll reply, “Mary said, so anyway”! It’s okay, really, he knows you! You’re Mary, the embroidery lady, on the computer! 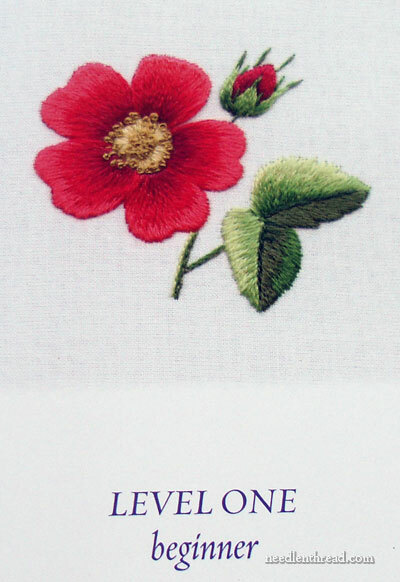 Doreen – I think you’ll find this book just the thing to get you started in needle painting. I’d begin with the practice elements, and then move right into the beginning level projects. 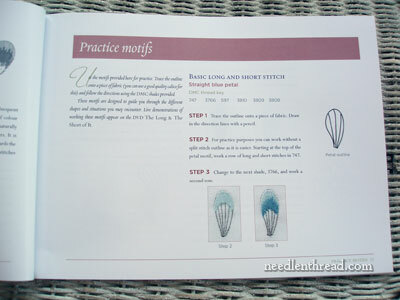 It’s definitely set up so that beginners can start at the beginning of this book and work through each level, and become really proficient in needle painting! Hi, Sue – I’m going to have to hassle our local library to get some of these titles in stock. They have a deplorable dearth of anything needlework related! I’m glad you’ve been able to find them in your local library! Anita – I think the pre-transferred designs are a great idea, just exactly for that reason: the beginner can launch straight into stitching, without having to worry about the transfer. After stitching a few similar pieces, you do tend to become more familiar with what the transfer should be like, and then when you decide to do the transfers yourself, I think you end up doing them with much more confidence. Glad you like the review – and thanks for your comments! Thank you Mary! This is perfect timing, as I have been collecting and cataloging DMC floss in anticipation of trying the needelpainting technique. But I have been hesitant to start due to lack of knowledge. Trish Burr’s book is the perfect answer. As always, your daily website is the first place I visit each day. Thanks so much for sharing all the information you do. It’s like having an embroidery club in my home. I love this new book of Trish Burr’s. I have taken several out of our local libraries but not a long enough time to do anything so I just “read” them like a book and then wish! Wish they weren’t so costly. I love your reviews and projects. I pre-ordered this one and just can’t wait to get my copy. Good review. Mary, I am so excited! I have wanted to learn needlepainting for a long time but never found a resource for a beginner. I have seen Trish’s work and heard great things about her..especially here. I love hand embroidery and do models for an online designer. The price is so reasonable I’m off to order my copy. Thanks so much. You are a treasure. Thank you for the review Mary. I have already pre-ordered my copy, to go along with the other three I own. I was lucky enough to participate in an online course with Trish and it was a terrifically rewarding experience. For anyone thinking about ordering her pre-printed fabric, it is well worth it, and beautiful to work on for this technique. Terrific review. You make embroidery “sing”. How fortunate we all are to have you amongst us. Have pre-oredered also. Must wait until October. Thanks for the great review, Mary! I’ve long wanted to try needlepainting, and this book looks like just the thing! I’m definitely adding it to my wishlist! Meanwhile, I’m going to try your tutorial, after I finish my current blackwork project. I HAVE to have this book!! When will it be available for purchase in the US? I looked on Amazon and they offer a pre-order but no details on the release date. Thanks BUNCHES for sharing this book with us! Sandi, I purchased “Needle Painting Embroidery” by Trish Burr yesterday on Amazon for about $17.00 (including shipping). Their estimated delivery date is October 7 – 12. Wish is was sooner, but just have to be patient! Embroidery people are patient right Mary? I won’t be buying this book. Like many of its companion books in the shops and libraries etc, it has birds and more birds in it, and I am seriously ornithophobic. I can zip past a picture in a book now, but it has taken me a long time to get this far. Boo hoo, because I would really love a book like this without the ….. Can anyone recommend one? I have ordered the 20th Century Embroidery one though, it looks absolutely yummy and I do have Trish Burr’s Redoute Roses book, just to show that it is not a personal thing. Just those darned creatures. Bemused husband just looks on in puzzlement for now. But if you hear your name being taken in vain some day, I apologize in advance! Oh what a neat book! I am a beginner and a wannabe embroider. Thank you so much for holding this draw! I have been loving your daily tips and techniques! Wow! Can a beginner really do this? I would really love to be able to do this type of embroidery. This book will help me to find many little differences between how I work and the way I should do it. Many thanks for your generosity. Hi Mary, What a great review! Trish’s book looks yummy. I did long/short stitch needlepoint about 25 yrs ago and really liked how it turned out. Would love to learn how to the same in embroidery. Both yours and Trish’s works are beautiful, to say the least. Aspire to do the same. Thanks much for your blog. I am fond of embroidery,and I would like to learn how to do long and short stitch properly. Love have this book. first it can help me with english language, and second it well teach me new methods of embroidery to use on new projects. with my regards to you. Hi Mary, I love your website. I belong to the Wasatch Chapter of the Embroiders Guild of America and I have found your site very helpful to me in the embroideries that I do. The needlepainting book is something that I would love to win, as I have done two of Tanya Berlin’s designs and would also like to do some of Trish Burr’s designs as well. I would really love to win this book. Needle painting is something I’d lopve to try. Thanks you for all the lovely tutorials you give us. I am in Kuwait. I need buy this book .please help me. By mail i can not buy. Is there any book agent in Kuwait . I bought and now own this book! My first of Trish Burr! It is all I hoped for as a beginner needle paint hopeful. It sure has coffee-table appeal, too. I have this book and I absolutely love and recommend it! I have made some beautiful art using her easy to understand instruction as well as her beautiful patterns! Last night I tried to comment and I think I couldn’t (I’m not sure). That’s why I’m posting this now. With limited funds for buying books, I have been reading and rereading reviews (yours and amazon) trying to analyze which Trish Burr book on long/short stitching to buy — specifically between ‘Needle Painting Embroidery’ and ‘Crewel and Surface Embroidery’. Which book would you recommend — what do you see as the difference between them? I have done one crewel kit (birth announcement) and a set of Aunt Martha’s frog tea towels — not especially experienced (although I spent years cross-stitching), and have questions/problems about long/short stitch. I hope you have time to answer this! Hi, Holly – I’d definitely go with Needle Painting Embroidery. It will give you the most thorough coverage on the subject from her books. 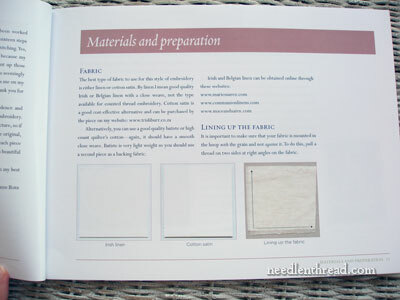 Another excellent book – and slightly less expensive, if you’re buying new, but with lots of used options, too – is Clare Hanham’s book, Beginner’s Guide to Silk Shading, which I reviewed here: https://www.needlenthread.com/2007/10/book-review-beginners-guide-to-silk.html If you’re just learning long and short stitch, I’d lean more towards the Beginner’s Guide, but both will work for beginners, so if you’re wanting to try Trish’s projects and follow her approach, then I’d go with Needle Painting Embroidery. Next Next post: My Social Chicken. Embroidered.